Southerners want independence. But could some of their own threaten the vote? The overwhelming sentiment here is that the “future” must be that of an independent South Sudan. Both organized and spontaneous rallies have been taking place every day in Bentiu’s stadium, a dusty patch of land with a single concrete seating area. Police, army, and church groups parade around the grounds before a crowd waving banners displaying the symbol of separation: a single hand with an open palm. Promoting this symbol is key because, with a population that is 85 percent illiterate, the referendum ballots will present voters with their two choices in visual form: two clasped hands for unity with the north, and the single hand for separation. Preparations for the vote have gone surprisingly well, despite a tight timeline and other logistical hurdles. But fear that disruptions could keep people from the polls or otherwise hinder the voting process is ever-present. 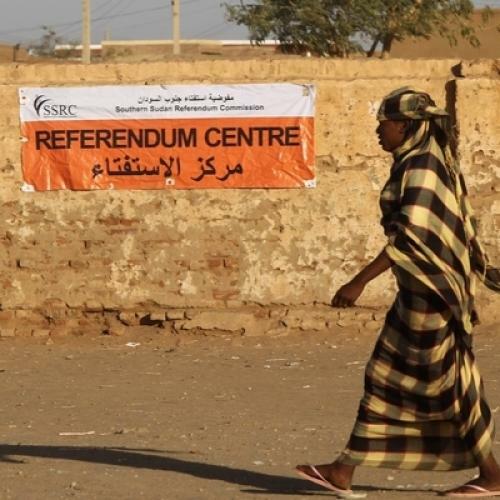 And, for officials in Unity state, the risks come as much from southerners as from the government of Sudanese President Omar Al Bashir in the north, which opposes secession. Indeed, there are concerns that some figures with power and influence in the south will try to impede voting. During Sudan’s long years of war, which split the north and south, two prominent southern leaders, Riek Machar and Lam Akol, fought against the main southern rebel group, the Southern People’s Liberation Army (SPLA), with some support from Al Bashir. After the 2005 peace agreement was signed between north and south, Machar was integrated into the SPLA’s political wing, and, today, he is the vice president of southern Sudan. But, in national elections last April, Machar’s wife challenged Unity state’s SPLA-supported incumbent governor, Taban Deng, and violence broke out between her supporters and the SPLA after Taban was declared the winner. Despite this recent divisiveness, Vice President Machar stood with Taban in Bentiu’s stadium on Friday to deliver a message in favor of separation. The southern government’s relationship with Lam Akol is even more fraught. In the build-up to last April’s elections, Akol formed his own political party and ran for the southern presidency. When his supporters contested his defeat, the SPLA responded by clamping down on his party’s activities. “They shut down our offices and took all our possessions,” says John Jangluak Pliok, the party’s chairman in Unity state. Pilok says Governor Taban has banned the party from going to polling centers outside of Bentiu during the referendum. In the days leading up to the vote, there have been unconfirmed reports of violence between the SPLA and Akol’s supporters in Mayom County, about a three-hour drive from Bentiu. And a local radio station has reported allegations that Akol’s party has been buying voter registration cards. Rebecca Hamilton is the author of Fighting for Darfur and a fellow at the New America Foundation. Her Sudan reporting is supported by funding from the Pulitzer Center.